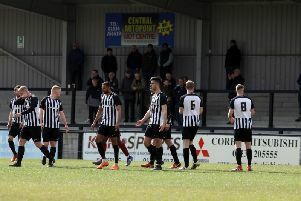 Steve Kinniburgh hailed the character of his Corby Town players as they twice came from behind to claim a fine 4-2 victory at Newcastle Town. While their play-off hopes in the Evo-Stik League South appear to be all-but over, the Steelmen are doing all they can to finish the season on a high. Youngster Zac Allen grabbed his first senior goal for the club after Jordon Crawford had scored Corby’s first equaliser as they went in at 2-2 at half-time before two second-half efforts from Steven Leslie wrapped up the points. Corby are now unbeaten in four matches and boss Kinniburgh believes the character they showed bodes well for the future. “It pretty much summed up the season, having to come from behind like we did,” the Corby manager said. “I would hope that character we showed will make every team realise that even if they get the first goal, we are not going to be a side that lies down. “We have a team who are always ready to fight, a team that has a lot of character and a lot of desire to do well for themselves and for each other. “It’s really good to see and it gives us something to build on going into next season. Kinniburgh, meanwhile, hailed the impact of academy product Allen in recent weeks and firmly believes the future is bright for a number of youngsters at Steel Park. He added: “I am, delighted, absolutely delighted for Zac and all the young players who have come into the equation over the last six weeks or so. They have really stepped up. “Zac has been pushing through the academy and if he couldn’t get a chance in the first-team at this stage of the season when we are in the position we are then when would he get that opportunity. “He has made four appearances for us, now he has got his goal and he has a big future in front of him. The Steelmen have two games left this season and they play their final home game of the campaign against Market Drayton Town at Steel Park next Saturday.